Top Ender and I are just back from the Theatre seeing a performance of Starlight Express. 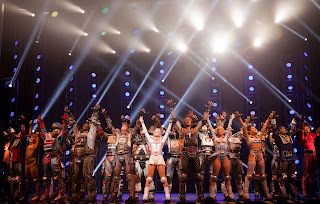 I was hoping that this high energy show would give Top Ender a life long love of the Theatre and of Performing, just like it had me when I was younger (not too much older than she is now) and although I won't know if that has worked for many months and years, I do know that she loved the show (and so did I!). 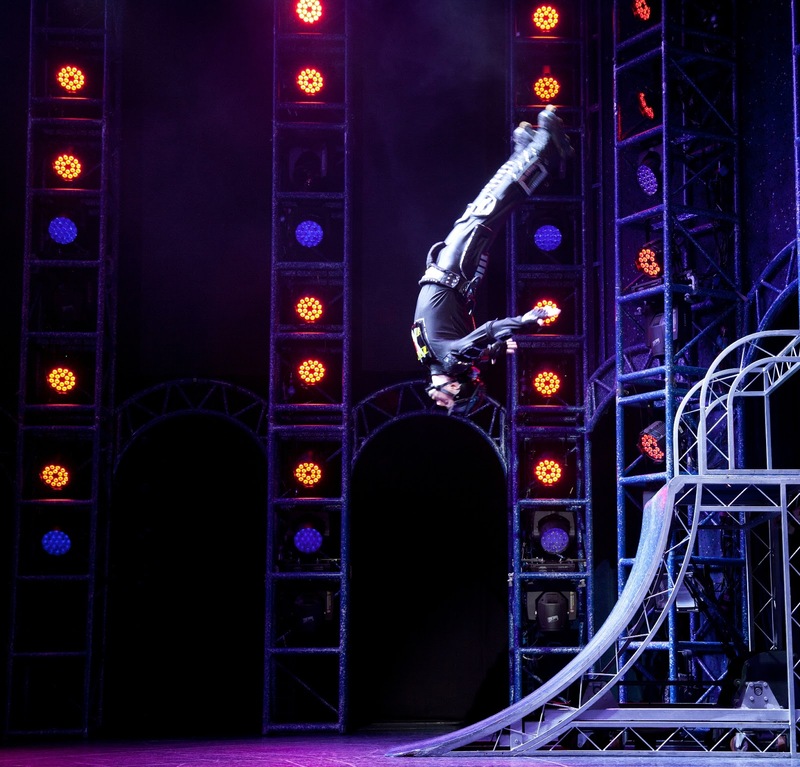 When you see someone on roller skates flip over as in the photograph above, you just know that there are injuries a plenty amongst the cast but as Top Ender came to realise in the course of the show sometimes you have to take risks. I think that without even meaning to, the cast taught Tops a life lesson, but then again what do I know? 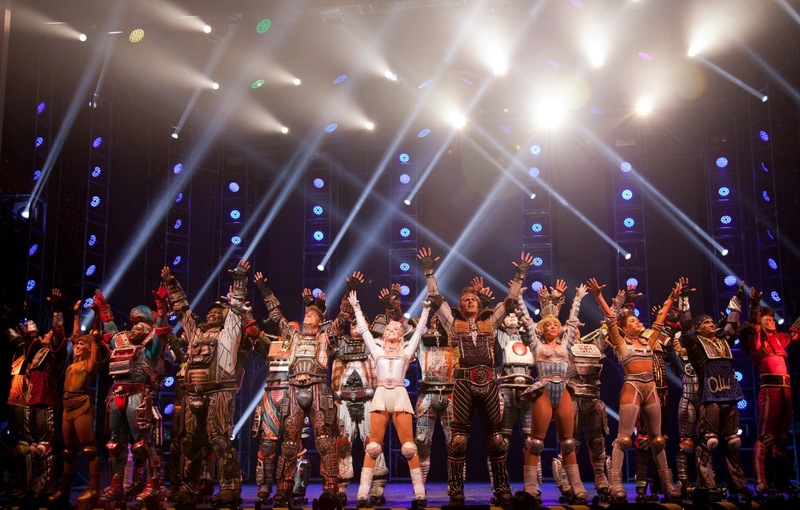 Maybe Sir Andrew Lloyd Webber knew all those years ago that this show would teach little girls and boys all across the world not only that the theatre is exciting, or even if you believe in yourself you will succeed but that sometimes need to take risks and your Mum is always right. If she says you'll enjoy a stage show, then enjoy you will. 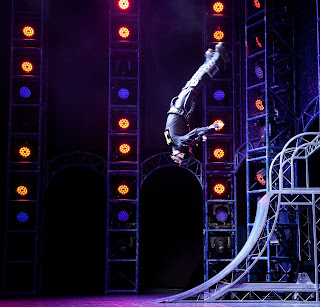 If you have a chance to go, the show is at Milton Keynes Theatre until May 4th 2013. We were given two press tickets to attend. For dinner this week, we had Fish Pie. I love fish pie and so do the children but Daddy isn't so keen. The problem is that fish pie is easy and tasty to make and I didn't want to stop making it... So I waited until Daddy was going to sleep and decided to ask him some questions about why he didn't like fish pie. Daddy didn't give me much information, mostly due to him being sleepy, but he did say he doesn't like vegetables in the fish mix and he was pretty sure he didn't like the white sauce the fish was normally in. So I decided to use a tomato based sauce. I cheated slightly and used some of the new Aunt Bessie's mini rustic Rosti's instead of making my own Rosti toppings. I've no doubt that I'll be making it again, although I'm going to see if I can sneak in some vegetables into the tomato sauce. Just in case someone somewhere wants to know what I did. Chop the leek finely and place into a frying pan to sauté in the oil and melted butter. Turn on the oven to gas mark 6. Place the fish into an oven proof dish and add the parsely and seasoning. Add the passata and sautéed leek to the dish and place in the preheated oven at Gas Mark 6 for twenty-five minutes. In the future I'll purée some vegetables and add to the Passata before adding to the fish. Stir well before adding the Rosti topping and a handful of Grated Cheese. Place back in the oven for twenty minutes before serving. Daily Affirmations. They can help you physically and emotionally, they can help you pick yourself up and dust yourself off when you're needing a bit of love or a kick in the pants. Do you think that they work? I was at my Sisters house yesterday and I couldn't help but notice a rather large display of post it notes on the side of the Kitchen cupboard. I could see that everything was in her handwriting, but I couldn't work out what they were or why there were four rows (I thought one for each of her daughters) and I didn't want to read them in case they were personal. So I asked her about it. Kitty (that's my sister) told me it was her affirmation station (actually that's what I said as I know bigger words than she does thanks to a misspent youth of reading the dictionary) and that she put up quotes that she found inspirational when she was having a down moment. Then she would spend a few moments reading each quote and realising that she might be feeling a little depressed, but that she was blooming marvellous and so would stop feeling down. I said that I wished I had somewhere to put post it notes of a similar fashion and somewhere that I could easily get to. Kitty said it could be anywhere, inside your wardrobe, bathroom cabinet, the side of your fridge, behind your desk, on the side of your bedside table. The point is that you know where it is and can see it when you need a little boost. 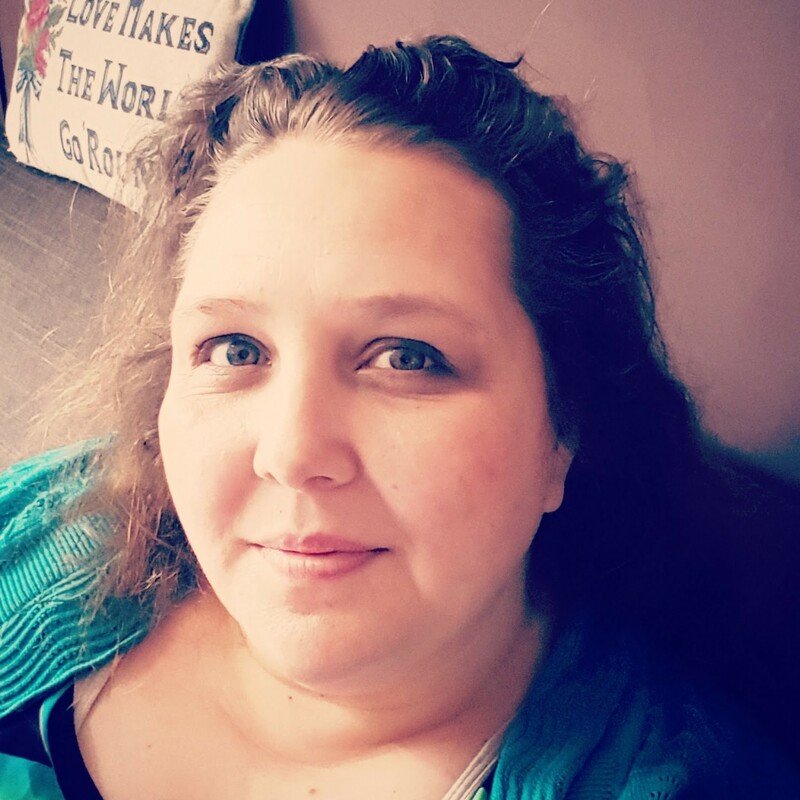 I told her that I was going to blog about this, because it is a fantastic idea and Kitty said that you might want to follow her Pinterest quote board Cool Sayings to see some of the great quotes she has already found and in anticipation of the ones that she will find in the future. Top Ender is rather like me and loves to curl up with a good book. Occasionally we end up with new books being sent in the post and I'll ask Top Ender to read them. 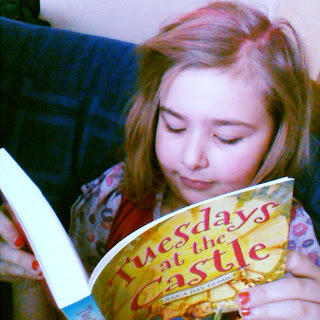 Unlike me Top Ender likes a specific kind of fiction and if something doesn't appear to be in the genre of choice (Fairytale type stories) then she'll huff and puff about it... I had to convince her to give Tuesday at the Castle a go, even though it's fairly obviously slap bang in the middle of her genre of choice! It did take Top Ender a while to get into the story. I'm not sure why, maybe the lure of her Tablet with 100's of books at her finger tips was too great, or maybe as she said, it was because she didn't realise that this was a fairytale type story but eventually she realised that holding a proper book in her hands was a good thing and read and read and read. In fact she didn't stop reading the book, I swear it went everywhere with us and I even had to say to her that she wasn't to be reading it at Church after seeing it in her bag next to her Scriptures! The story is about a Princess named Celie whose parents are ambushed by bandits when at their son's graduation and leaves their other son acting as King and Princess Celie having to use her wits and help from the magically room producing Castle to protect her family and the kingdom. So standard Fairy Tale stuff really. Top Ender loved the book, and has explained the story to me, including a few little plot twists and has actually made me want to read it, which I'll do tonight once she has gone to bed. From what Top Ender has said the story reminds me a little of Hogwarts moving staircases and magically appearing room of requirement, and Howl's Moving Castle (I've not read the book, only seen the Studio Ghibli film) but also doesn't try to replicate the atmosphere of these stories and creates its own magic setting and loveable characters. Tops is really eager for the sequel (Wednesdays in the Tower) and seeing that it will be available in August she hasn't got long to wait. The book is aimed at adventure lovers aged between 9 and 11, although I think that I might enjoy this book by Jessica Day George just as much as Tops did and I'm way older than 11. We're looking forward to lunches this week, as I've promised a few special treats for Top Ender and Big Boy, although if my disaster with the Pizza Muffins last week are anything to go by maybe I shouldn't have promised! We love cheese toasties and they are an easy lunch to have on a Saturday. I'm going to add a bit of Onion and Tomato to the sandwiches so that they count as a portion of veg, but I'm going to need to make sure to remind everyone that the filling is HOT. 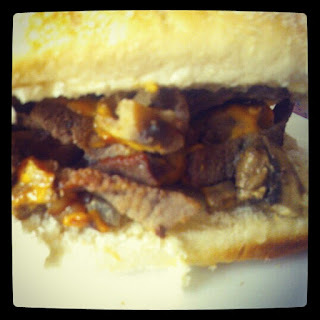 I really liked the Cheese Steak Rolls that we had a few weeks back and so I've decided that we're going to have them again today. Daddy won't mind as long as I use good cheese and give him a good size serving. The children won't have as much onion and mushroom as Daddy and I as they don't like it, but there will be plenty of fresh fruit available as pudding. I'm pretty sure that this is the lunch the children look forward to most because they never leave a crumb in their lunch boxes. I'm still slowly teaching the children how to eat Salad and I find that this wrap is always a good way because they don't see what is hidden inside... although I have discovered that Top Ender is a Cherry Tomato fan as long as she doesn't know that is what she is eating. As we didn't have a Meatless Monday (as Big Boy got to choose dinner) we're having it on Tuesday this week. For lunch today, I've planned Veggie Sushi Sandwich wraps. Big Boy decided last week half way through his lunch of Couscous that he didn't like Couscous and that if I was going to feed him pasta it should be the normal sized stuff thank you very much. So that's what he and Top Ender have today. I'm partnering it with a very low carb pudding as the pasta is quite high in carbs unsurprisingly. I think that egg is an underrated sandwich filling and with the addition of a little chopped tomato or cress (which Big Boy is growing at School at the moment) I think that it has the ability to look as good as it tastes. It's National Pretzel Day. Yeah, I didn't know that either. Anyway, today's lunch will contain pretzels and will have an American theme to it (Pretzels are American right?) and will also be seriously cute! As a side note, I always use My Supermarket when writing up my shopping list as it means I can compare how much my shopping costs in different supermarkets without having to go to each individual website AND if I wanted to I could also order online and get cashback on some items. James Foord sent me an email (and no doubt 100's of other regular users of the site) during the week promising that if I recommend someone to My Supermarket and they do a shop then as long as I email him my email address and that of the friend I recommended that we'll both get £10. I don't want Mr Foord's money, but I do want to let you all know about the service they offer as it regularly saves me £20+ a week and I think that's far better than a one time offer of £10. 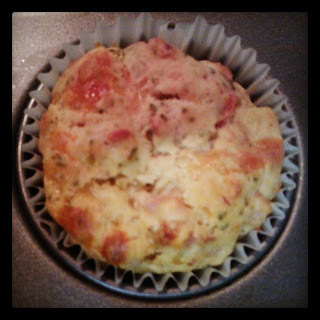 Yesterday we should have had Pizza Muffins for lunch, but I forgot to make them on Wednesday and I didn't get up early enough to make them before School... so I moved them to today and boy am I glad that I did! If you feel like making Pizza Muffins then here is the recipe and method and remember they taste DELICIOUS and they make the kitchen smell divine! 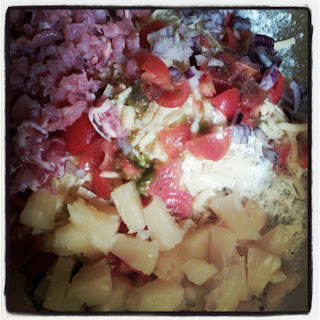 Mix the dry ingredients together and the ingredients for the Pizza flavouring, (I've gone with a"Hawaiian" theme as Top Ender loves a Hawaiian pizza and hopefully Big Boy won't notice the pineapple). Season well with Salt and Pepper. Add the wet mix to the dry mix and stir well. Make sure that the distribution of the ingredients is equal. Oil a Muffin tin and place one heaped tablespoon of mixture into each muffin well. 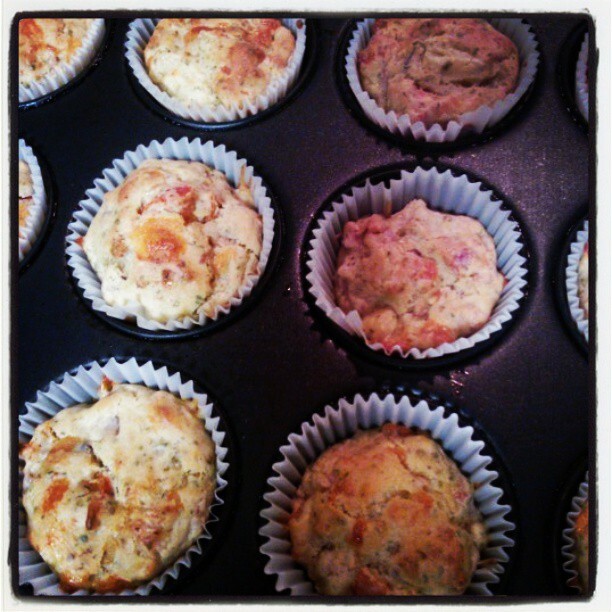 Alternatively place a Muffin liner in each cup and place the muffin mixture into each liner. Bake in the oven for twenty-five to thirty minutes at gas mark six (some of mine took longer to brown nicely and evenly) and when cooked leave to cool for a few minutes before transferring to a wire rack to cool fully. You can eat the muffins hot, or at room temperature but if you do eat one hot then remember to hide the others so you don't eat them all! If you want to know, I made 21 from this batch and that means that each muffin has 10g of carbs. BURP! I'm sorry about that, I've got terrible indigestion from dinner this evening but despite that I know that meal planning whilst I'm fully fed is the best way for me to choose meals which everyone will like for the next week. For our Saturday meals, I always think of the meal as being a treat because it's something we eat whilst watching Doctor Who and it's normally something a little more Take Away like. Tonight we're having Hassleback potatoes (which I'll throw in the oven before I take my Mum back home) with Cheesy Pork Chops. I think that the Sunday Roast is one of the best meals of the week, mainly because I don't cook it but also because it's the one meal that we have every week and the one meal that we never change. Roast Chicken, potatoes, vegetables, gravy and yorkshire puddings. Yummy yummy yum. We're at the hospital this morning with Big Boy to meet with his Diabetic team and to make any minor adjustments to his Insulin to Carb ratio and so he always gets to decide what we have to eat as a "reward" for having been good. As usual Big Boy has decided that we'll have Home Made McDonalds. If Big Boy hadn't have chosen last nights meal then we would have had this Risotto as part of our Meatless Mondays. Daddy isn't looking forward to this dish, but preferred the sound of it to the Dahl I offered! Daddy doesn't like fish pie. We've chatted about why this is, and he isn't really that sure... So we're going to try a few different things to see if we can find out what it is that Daddy doesn't like about fish pie. This week we're going to see if having a tomato based sauce instead of a white sauce helps. I'm also not adding any vegetables as apparently Daddy also thinks that this might be a reason he doesn't like fish pie. 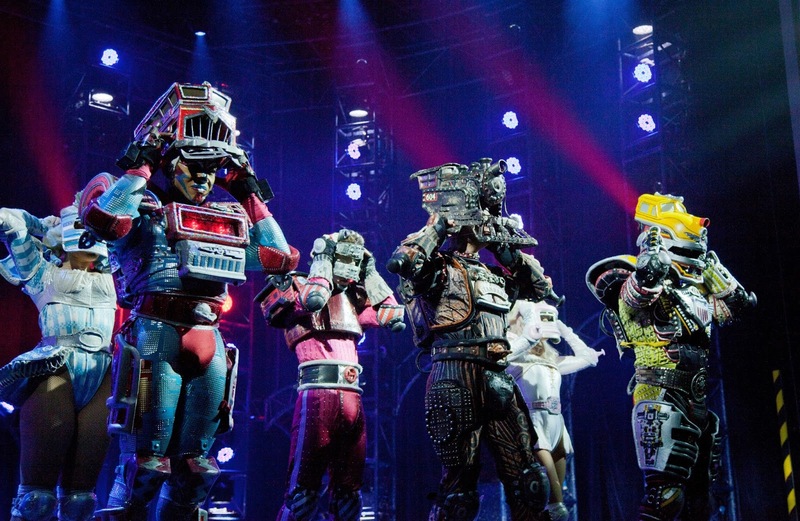 I'm off to see Starlight Express with Top Ender this evening, so we're going to have a quick dinner so that we can make sure we are at the Theatre on time. Daddy and Big Boy are going to have a lot of fun together and I have no doubt that Daddy will let Big Boy stay up a bit late so he'll be getting a treat too. I'm making Cannelloni using Lasagne sheets because I've never made it before and I felt like a challenge! Daddy and I were chatting about different dishes we like and we thought that we'd make some Chicken Kievs (we haven't found a good gluten free one yet), but then when I suggested we make them using Haddock instead of Chicken we knew we were on to a winner. We're not sure how we're going to make them just yet, but then I have all of Friday to work it out! We're going to serve the Fish cakes with herby mashed potato and steamed vegetables. I've been thinking about the ways in which people eat meals this week, my husband grew up knowing what meals would be served on what night and I grew up not knowing until the meal was on the table (Or I helped make it) one week to the next. What do you do? I'm wondering if I should move to a schedule of meals over a month or a fortnight or if that's not a good plan. When I was younger my two youngest Aunts would often let me join in their games. Some of the times I remember best would be where they would teach me a dance routine to a song. I can't remember if I was any good or not, but judging from my inability to dance now I'm going to say I wasn't. 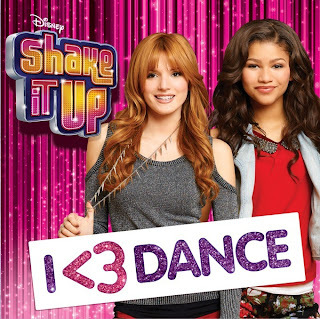 Top Ender and Big Boy love playing the same sorts of games, and Top Ender will often make a dance routine up to music she hears on the TV, or thanks to her love of Shake It Up she'll learn a dance routine that she has watched multiple times. 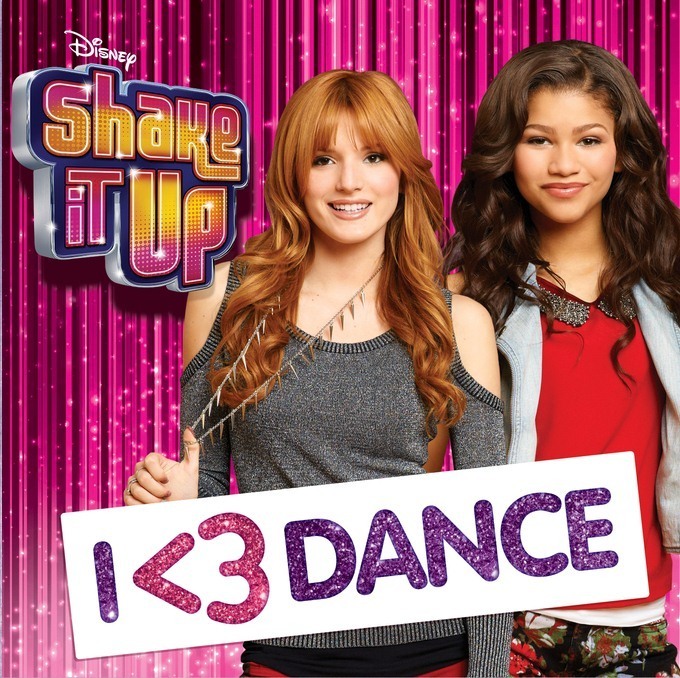 So when we were sent the Disney's Shake It Up I <3 Dance (get it I "heart" Dance) CD Tops was over the moon. Having played the music whilst we were doing some homework, I was shocked to realise I recognised none of the tracks. I thought I was more hip than that. Top Ender however happily sung away and has since created several dances to her favourite tracks and I've learnt the lyrics... to the best of my knowledge anyway. Big Boy and I are hearing the CD quite a bit, with Top Ender playing it not quite at full blast after School, and we're coming up with our own dance routines for the tunes. Again I can't say that we'd ever make it on to Shake It Up, or even BGT but it's a fun little way to exercise and it does mean that come the next School Disco the children will be able to work out a nice little routine together! We were sent a copy of the CD to review. I'm not sure how he does it, but Big Boy knows about new games coming out before Daddy and I (I have a sneaky suspicion he has a subscription to a gamers magazine) and has been going on for what seems like months about how we need to get a Wii U so that he can have the new Lego game "Lego City Undercover" as we won't let him have a Nintendo 3DS (it's his birthday soon capiche?!). He even went as far as "building" his own Wii U at School, although I'm not sure the TA knew quite what he was on about. And then a box arrived. I had a sneaking suspicion about what was inside and so let the Children open it later that evening and Big Boy was delighted with what he pulled out. Inside the box was a letter from Nintendo, which Big Boy has put on his pinboard (he wants to work for them when he's older). 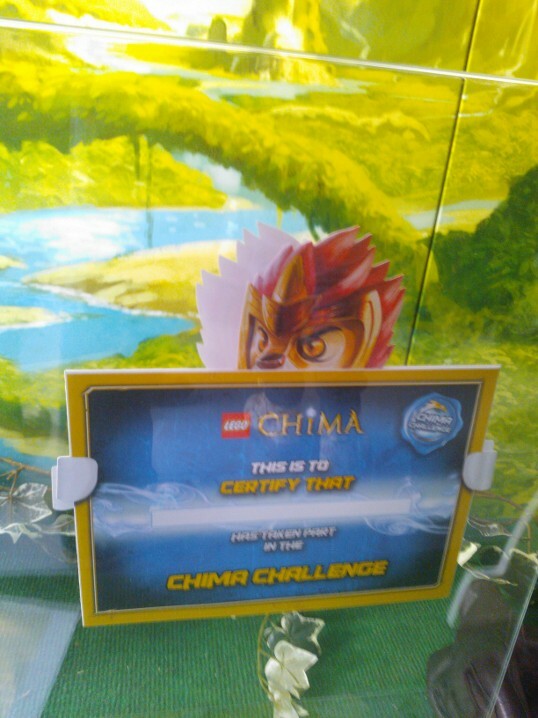 Not only had they sent us a Wii U with a copy of Nintendo Land, but they had sent us a not out in the shops yet Lego City Undercover game for the Wii U, a cupcake (Big Boy demolished it), a hat and eye mask to dress up in, some Lego Stationary and some Lego City Lego. I knew it. I knew that Popcorn Fish would be a success with the family and when we ate it on Tuesday night, the Children's and Daddy's second helpings confirmed it. As it was so successful I thought I'd add it to my growing collection of fish recipes, here on the blog. Mix the batter ingredients together until they are well mixed, it will look quite thick but that is good as it holds together better. You may find you need to add more milk to get it to a consistency that is right for you and as this recipe is gluten free, if you change it to "normal" flour, you might find that you need less milk. Cut the fish into bite size pieces and put into a bowl. Add two tablespoons of flour to the bowl the fish is in, and mix to coat the fish pieces. Slowly drop pieces of fish into the batter and cover in batter. Drop in to either a deep fat fryer of hot oil (use tongs to save your fingers!) or a frying pan of hot oil. Ensure all the battered fish pieces are turned so that all sides of the fish are golden. Remove the fish from the oil and serve! I know that this is just a variation of fried fish, but honestly the Children loved it and ate more than one serving. Back in January I posted a long list of things that I wanted to do in our home, a giant to do list. I was breaking it down into quarters because it's easier to manage and because a lot of what we want to do is Seasonal. Well, now it's time for my 2nd list of the year and here it is. The first 12 items are pulled from my last list as they didn't get done in the first quarter (apart from the Swagbucks one), but hopefully with the weather warming up (PLEASE!) I'll be able to get to them in this quarter. 1) Paint the hallway to remove the stains BB left. 2) Fix the skirting board in the hall. 3) Weed the driveway at the side of the house. 4) Make an attempt at clearing the back garden. 5) Sort out Top Ender's bedroom. 6) Clear out the Garage. 7) Clear out the loft. 8) Teach myself the guitar (I'm getting better, but need the time to practice). 9) Find a way of buying a new (to us) car. 10) Wash all the curtains. 11) Line Big Boy's curtains. 12) Hit my swagbucks target everyday. 13) Lose 26lbs through diet and exercise. 14) Get a proper cleaning routine in place. 15) Establish Date nights for the Children and us. 16) Go on Family Walks. 17) Paint the Bathroom and Kitchen doors. 19) Do some form of weekly Volunteering. 21) Plan Big Boy's Birthday. 22) Get ready for the Summer Holidays. 23) Play around with the "expensive" DSLR camera. 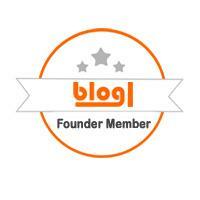 24) Comment on at least one blog post a day. How about you? Have you got plans for this quarter? Another week of packed lunches as the Children are back to School on Monday, this is good as it means as long as I remember to keep my camera charged there will be lots more pictures on our Facebook page of ideas for lunches. It's National Scrabble day so today we're having Scrabble Sandwiches, which basically means sandwiches cut into cubes and if we have enough time we'll write different letters on top. If we don't have time then we'll just pretend and give ourselves triple letter scores. Last week Daddy found this sandwich in Costco and asked if we could have it for lunch on Sunday at home. So we're having it today! I just hope that the local deli stocks Provolone Cheese as I don't think the local supermarkets do. Top Ender pointed out the other day, if we have Meatless Mondays why does our lunch have meat in? I had no answer, I had thought of it as the evening meal being meatless, as lunch was just using up yesterdays leftovers but have decided to show Top Ender that this week I can pay attention and do a veggie lunch too. We're big fans of a Chicken Sandwich, so instead of having it on the Monday we've had it today. I'm adding some mayo (well mayola with no eggs) and chives and some form of vegetable, not sure what yet depends what I buy on Saturday! It's Daffy Ducks birthday today, no really it is. So today we're having a Cheese Sandwich as then he'll be able to join in with us as I'm sure all Ducks like Cheese. Hopefully the sandwiches will be looking like Daffy... If it doesn't then it will still be a Cheese sandwich and who could ask for anything more on a Wednesday?! I did think about doing Tuna Pasta today, but I thought with having Haddock tonight it might be a bit repetitive. So I've gone for Pizza Muffins instead and I hope that the children will appreciate getting to eat what is normally a "cake" as a main dish. Lunch today is actually a ham sandwich, but it has a little theme that would have been more fitting if it were a cheese sandwich (have you guessed?!). Luckily thanks to some savvy shopping a few weeks back I brought something rather fun that will make the main part of the lunch easy to make, which will allow me to play around with the pudding part a little more. And that's this weeks lunches, which I'm hoping will be tasty, fun and help Big Boy's blood sugars stay in a nice and "safe" range. I can't believe how quickly the weeks are going by at the moment, it seems that as quickly as I blink that another week has passed. On one hand I don't mind this, because it will soon be my birthday and Summer but on the other hand I'm terrified as it means that soon it will be Big Boy's birthday and then end of Summer when he'll be starting Year One. We had the BBQ Chicken Burgers a few weeks back and I discovered that not only did you only need half a Chicken breast per person, but also that it was DELICIOUS! So we're having it again. I'll serve it with Salad and Wedges. I love the way that Daddy has taken over cooking the Sunday Roast. Even when I was home last week watching General Conference he still carried on this new tradition. Now I just need to teach him how to carve the Chicken and we'll be away! Last week we had Jacket Potatoes, which was great as I had slow cooked them and had a great discussion on Facebook with so many people about how easy they are to do that way. This week we are having Soup and Toasties as it was put to a vote and that was what won. This isn't the kind of Prawn Toasts that you get from the local Chinese (although I do know how to make those! ), but these Prawn toasts are prawns on toast. We love a thick dip that we can get from one of the local Deli's that is Sweet Chilli flavoured, which when spread over toast and covered with Prawns is DELISH! We'll serve with Salad and extra slices of toast, as my children are pains and hate salad. When we had the Hake Fish Stew the other week, Daddy and the children loved the cubed potato in the bean mix and Daddy whilst thinking of an complimentary dish to another meal (tomorrows Mackerel) asked if we could have that part of the meal again. We decided to have it with Gluten Free Sausages because we can! I was looking for a side dish to have with our Smoked Mackerel, as I didn't want to have potato again (we seem to be potato heavy at the moment) when I came across this recipe (click the title) and we decided to have it and to serve with Green Beans too. Hopefully ours will look as nice as the one in the photo. Daddy is out at work tonight, so the Children and I are having a gluten filled meal of Sausage pie filled with our favourite vegetables and obviously Sausages. I'll also make a quick pudding up of Ice Cream Sundaes for the Children as a Friday night treat and I'll have fruit (I don't like Ice Cream!) and if we are all really good we might stay up late too. Every week I always ask if you are inviting yourself round and in which case on which day, but this week I'd like to know what side dishes do you normally serve with your meals? Are you a potato or a pasta or a rice fan or am I missing something really obvious? What do you do when you have two pieces of Salmon and four mouths to feed? Normally, I'd just make sure that I have four pieces of Salmon but I thought I'd try something different after reading an article where a Mother fed her family of six (two adults, four children) on two breasts of Chicken. So I came up with this Easy Salmon Rice which fed us (two adults, two children) nicely. Put the oven on to Gas mark 5. Cut a large piece of tinfoil (enough to make a loose parcel around the fish) and grease it a little with the olive oil (to stop the fish sticking to the tin foil) place the Salmon fillets skin side down on the foil. Mix together the Chilli fish sauce mixture and cover the fish in the sauce. Fold the tinfoil to make a parcel and put on a tray into the oven for twenty minutes. Finely chop the Courgette and the Red Onion and fry over a low heat whilst the Salmon is in the oven. Cook the rice via which method you prefer (absorption or the other one). Remove the onion and courgette from the heat and take the Salmon out of the oven. Pour the sauce from the Salmon into the vegetable mixture and remove the skin from the fish fillets (easy to do honest!) and flake it into the courgette and red onion mixture. Mix the fish and vegetable mixture with the rice and serve. The dish tasted great, the spice of the sweet chilli mix was mellowed by the vegetables and rice mixture. This meant that the children didn't mind the spice and could appreciate the flavours, preparing them for slightly stronger tastes in the future. Now it is slightly warmer than it has been, I think it's okay to show some pictures of beautiful ice I've seen without feeling I'm cursing us Brits into yet more cold, ice and snow in April. Feel free to link up and remember that I love comments and tweets! Last week we ended up not eating our Creamy Hake Bake, as we didn't get back until late from our trip to the Science Museum, so we ate it the Hake on the Saturday night whilst watching Doctor Who. As I'm normally with my Mum on a Saturday taking her shopping, Daddy has to cook dinner but this Hake Fish Stew was so simple he had no objections to creating the recipe with me in a few minutes and then cooking it and working out any problems himself. Gently fry the onions in a glug of Olive Oil in a medium sized Saucepan until they are translucent. Add the potatoes and fry for two or three minutes, stirring to make sure that all sides of the potatoes are heated. Add the cans of Beanz and Tomatoes and simmer for twenty minutes. Around ten minutes into the simmer heat a griddle (if you have one) or a frying pan, with a small amount of Olive Oil and add the Fish skin side down. After a couple of minutes the skin will start to crisp up, but leave the fish on the skin side for four minutes total before turning it over and cooking again for a further three or four minutes so the fillet is cooked the whole way through. Serve the fish atop of the bean stew mixture, as that's what they do in fancy restaurants. Here are our plans for lunches for this week. As always, they are served with a couple of servings of fruit, some dairy and normally plenty of water or squash and a little pudding treat of a biscuit or similar. As I don't go shopping until a Saturday afternoon, it seems pointless having the "special" sandwich on a Saturday as I have to go and buy the ingredients separate to my main shop. So I'm moving it to a Sunday, which means if I get indigestion then I can suffer it at Church instead of in a Supermarket. Today our sandwich is inspired by the Gourmet Sausages you can buy in various Butchers and Supermarkets where the sausages aren't just your standard pork, but have apple or cherries or peak or something else in them. I'm teaming our Sausages (I don't know what they are just yet as I've probably left it too late to get special ones from our butchers with fruit in and no gluten, so they'll be just plain pork sausages) with a little stewed cherry and apple and onion mixture mixed together with a little honey and a dab of mustard all served up in Ciabatta bread (well as close to as our Gluten free bread allows). Using the leftover Chicken from yesterdays roast, I'll make rolls for us all to enjoy. I'll add a little chopped Cherry tomato to mine and some salt, but the Children just like Chicken. One of the great things about wraps, is that you can put anything in them and with some careful wrapping it doesn't fall out. If you then heat it in the microwave (or the oven or the grill) you can cut the wrap into slices and make great Wrap Rings which are bite-sized and perfect for little mouths and tummies. I've been promising the children we'll have afternoon tea during the holidays, like we do in the Summer and so today is the day. We're going to dress up and hopefully if the weather allows it eat in the garden. I have a feeling we might be dressed rather warmly rather to keep out the cold. Top Ender and Big Boy love Ham and Cucumber together, and I've discovered that in a Sandwich Big Boy eats the cucumber skin, which he doesn't do if it is a snack. Years ago I told Top Ender that we were having Monkeys on Toast for lunch. I'm not sure why, but it stuck and ever since if we're having Cheese on Toast we'll say Monkeys on Toast, which to me sounds a lot better than Welsh Rarebit any way! Those are our lunches this week, we're also going to try and fit in a baking session to make some Hot Cross Buns and soft Pretzels, so they will either be a pudding or an afternoon snack if we do get round to it. We had a great time on half term this last week, the children and I love being in each others company and luckily for us the weather whilst wasn't exactly warm it wasn't bad and so we've made the most of hanging around the house, trips to the local park and that sort of thing. I love a Stir Fry and whilst the children are more of the persuasion that a stir fry should have more noodles and less vegetables, they do eat it. Mainly because I keep serving it and I figure that they'll either go hungry or learn to like it! Tonight we're having it with Beef, which I'll season with Chinese Five Spice and Soy Sauce. I'm at home this week as it's General Conference and we can, thanks to the wonders of Modern Technology, watch this from any PC via the Internet. So I might be cooking Dinner, but as Daddy is fabulous at cooking Gluten Free and Egg Free Yorkshire Puddings now, I'll still probably get him to do it. And a pudding of Apple Crumble, because if you can't get your husband to make your favourite pudding once in a while what is the point?! I've been really good and not had Jacket Potatoes for ages because Daddy isn't that keen on them, but I LOVE them and so I had to do it today, especially as served with Cheese and Beans they make a great Meatless Monday meal that everyone will eat. I'm cooking extra potatoes tonight to go with dinner tomorrow. We have Saithe for dinner tonight, which I understand to be quite a fishy tasting fish. As Daddy isn't keen on fishy tasting fish I thought I would make popcorn fish, which I read about in a forum in the last few weeks. Unfortunately for us, you seem to be able to buy the fish ready prepared in batter in other countries and we'll have to make our own, but then as we try to eat things like this Gluten and Wheat free so Daddy can share we'd probably be making our own anyway. The idea is that you batter small bites of fish which then look like Popcorn. I'm serving it with Salad and Baked Potato Slices. This is one of the easiest dishes to make, gently fry off some onions, with some mushrooms and peppers removing from the pan and putting to one side before adding some Beef strips and frying in the oil and juices left in the pan until the strips are no longer pink. Add the vegetables back to the beef and add a can of chopped tomatoes and let simmer for thirty minutes whilst cooking Spaghetti. Serve with cheese on top. It's a Friday so I thought we deserved a treat, and I think that Fish Cakes are a treat. I'll make my own with potato and either finely chopped spring onions or chives (depending on what I have left by the end of the week) and serve with Sweetcorn and Cauliflower mash. So that's the meals for this week, hopefully I won't get confused and end up creating a fish curry or a fish stew again! I had two fillets of Hake and two of Cod, so I quickly pan fried the Hake which along with some Mash Potato and green beans was served to Top Ender and Big Boy. The only issue I have with pan frying Hake is that it sticks to the pan, this is good if you want to remove the skin easily, but rather annoying if you don't want the fish flesh to stick to the pan. I didn't take a picture of the Hake and Mash for the children, but it looked pretty good and as they ate it without asking questions I'm thinking that the indoctrination of my children is complete are far as fish eating is concerned. The White Fish Curry was really easy to make, and tasted great. Daddy said that it didn't taste fishy (he still doesn't like fishy fish) and I was pleased as it wasn't overly spicy. This is the recipe for it. Heat a slug of Olive Oil in a pan (I used a wok, but a frying pan would work too) before adding the onion and Peppers. Let heat through and the Onion start to get soft before adding some Green Beans. I did it by eye, but I used roughly one onion, half a green, red and yellow pepper and two generous handfuls of Green Beans. You can increase or decrease the amounts you use as per your own personal taste and availability. Let the mixture gently fry over a low heat, whilst you cut the Fish fillets in to chunks, then add the cut fish, the Curry paste and the water to the pan and stir well to ensure the fish and the vegetables are well covered. Let the mixture simmer for ten minutes, adding in the coconut milk around half way through cooking. Make sure to stir well to ensure the milk spreads through the dish. Serve with Rice or as I did as a soup with plenty of bread for dipping! I've posted before about a family day out to Chessington World of Adventures, which was roughly a year ago, and the children have wanted to go back ever since, but when the new Zufari ride started to be advertised, the children all of us wanted to go back and we got our chance earlier this week, thanks to being asked to attend the launch of the LEGO Chima Challenge. 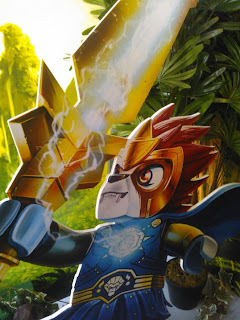 This blog post is about the Zufari ride though, as people who haven't yet been on it don't know what to expect. Hopefully, I don't give everything away as the excitement of the unknown always makes it more thrilling but enough so that those who want to know if it is suitable for their children can decide. There are plenty of warnings about who is and who isn't allowed on the ride, all all riders/researchers must be a minimum of 1.1 meters tall to ride and if they are under 1.3 meters they have to have an adult aged 16 or over with them. There can be a long queuing time, when we first went to go on the ride the queue time was 60 minutes, which with bored and cold children just wasn't going to happen. We returned later in the day and were pleased to see the wait time was reduced to thirty minutes, but we only queued for around twenty and when we came out of the ride it was reduced down to 15. Judging from the barriers that are set up, they are ready for wait times of around two hours, but there are a few signs to read about different animals to keep queueing riders entertained, and a green screen where you can pose for a photograph (no obligation to buy view at the end of your ride) and of course there is a soundtrack to the ride which you'll be humming along to after the first five minutes! The ride starts off with a video that explains the concept of the ride, Chase Van-Driver (I laughed hard at that) explains that in the part of Africa we are in they have found this lush area that is home to many animals and plant life and they need our help to catalogue it by going on an expedition. We're then warned by a Lemur, the camps mascot of sorts not to go in the cave, as terrible things happen in there and that some people who have entered never came out! Big Boy took this very seriously, as he's been taught by many cartoons, that if a Lemur can talk it deserves to be listened to. We headed out into our All Terrain Vehicles, where we advised to sit adults on the outside and children on the inside and place all bags under our seats and of course to put our seatbelts on. I was a little troubled by the amount of water on my seat and on the floor, but I knew that it was all a bit of fun and that I'd dry out soon enough if I got too wet. We headed off, with our driver making sure not to go too fast through the huge muddy puddles to see some animals on our Zufari. Unfortunately for us (and some friends who had gone on the ride two days before us) not all of the animals seemed to want to play expedition with us, although we did get to see some quite close. Whilst we were out on our trip, our route home became blocked and we had to take an uncharted route back to base camp right through the cave we'd been warned about! Big Boy was really taken in with the uncharted route through the cave, and told Daddy, Top Ender and I several times about how we were told that we weren't allowed to go in there, but that because our route was blocked we had to take the route and how it had been dangerous and wet. Let's just say with the adults sitting on the outside of the open All Terrain Vehicles the children are never in too much danger of being wet, although the adults (especially those last into the vehicle) might find they bear the brunt of it. There are a few adjustments/improvements I would make to the ride, (CWOA if you want to know ask me!) but it is a great ride and from the reactions of everyone coming off, worth the queue. 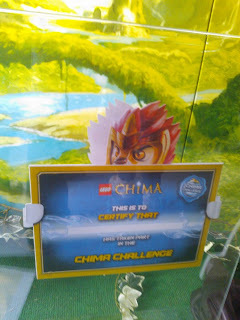 We were given tickets to go into Chessington World of Adventures, after having been to the LEGO Chima event. 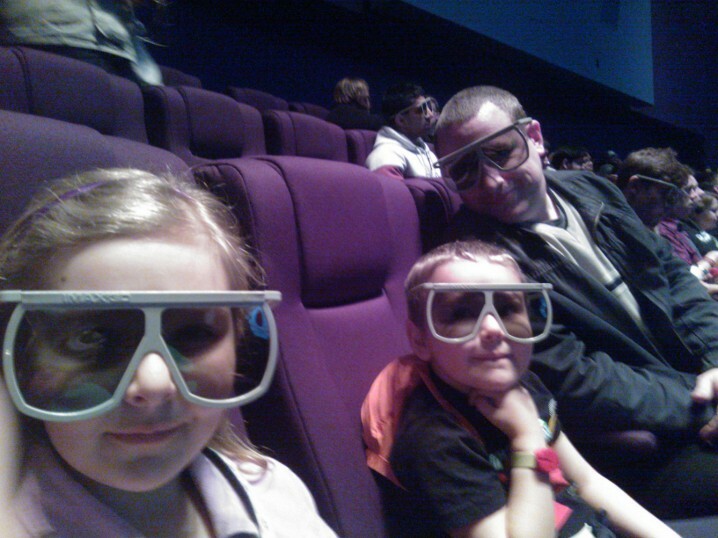 Big Boy was rather taken with the extraordinary views that the Hubble Telescope offered of our galaxy during the 3D IMAX screening at the Science Museum, despite being sad that all the planets orbited the Sun, but not "any daughters". "Did God make the stars?" I think Big Boy might have been playing a little too much Minecraft!